Depression, despair, despondency, longing, melancholia and heartbreak are unlikely emotions to trumpet at a time when anger and righteous indignation seem like the only affects we’re allowed to access for mass resistance and protest. However, in Ann Cvetkovich’s Depression: A Public Feeling, she asserts that these negative emotions can have significant political resonance despite their apparent inaction. 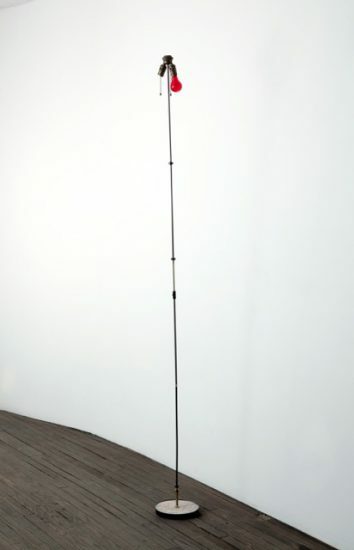 “Rather than seeing negative feelings of failure, mourning, despair and shame as getting in the way of politics or needing to be converted to something more active in order to become politics,” says Cvetkovich, “such work attends to felt experience as not only already political but as transforming our understandings of what counts as politics” (110). And Cvetkovich isn’t the only one. Sianne Ngai, in her book Ugly Feelings, similarly investigates politically ambiguous affects. Describing Ngai’s project in her own Feeling Backward, Heather Love writes, “The ugly feelings she surveys are useful insofar as they help critics understand the contours of the contemporary political situation, but they are not likely to ignite revolutionary action or even, mass resistance” (13). While this failure, particularly at a time of political emergency, seems useless and counterintuitive, Love finds strength in Ngai’s “ugly feelings” to “locate motives for political action when none is visible” (13). These gloomy–and seemingly apolitical–feelings are on view in INVISIBLE-EXPORTS current group exhibition Heartbreak Hotel. Admittedly, I was drawn to the show by my rabid Elvis fanaticism. I mean, how could I say no to the King?! 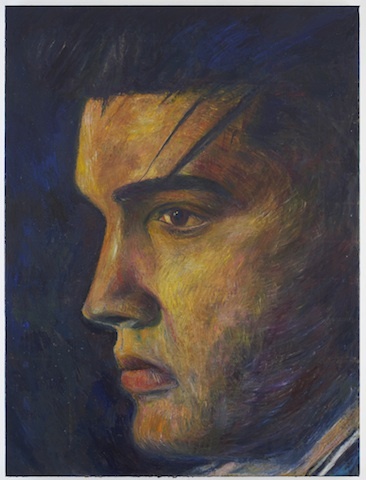 But beyond my Elvis obsession, which was satiated by Keith Mayerson’s portrait of Presley in profile in the gallery’s back office, the exhibition effectively encouraged contemplation of the importance and power of collective wallowing. In fact, the gallery sets up moping as a conscious political refusal. Granted, the first emotion I felt entering INVISBLE-EXPORTS was disappointment. This would normally be unwelcome, but with the show’s examination of sad sack feelings, low-level disappointment fits right in. Why did I feel so down in the dumps? I think it was that I’ve been steeped in political shows expressing outrage rather than bare and bleak representations of misery, angst and anguish. 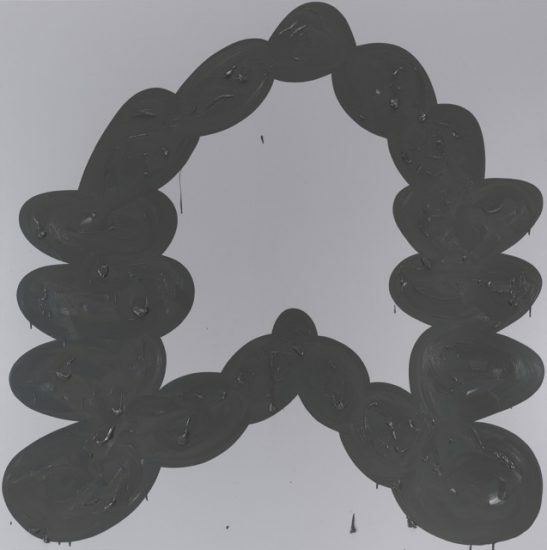 Some of this might have to do with the first work I saw: Amy Feldman’s Duly Doom, an enormous canvas depicting a giant ring of dark grey on a lighter grey canvas. While Feldman has had a spell of bad attention lately with RM Vaughan’s memorable polemic against the painter’s work, getting a bee in his critical bonnet over her monochromatic engagement with absence and vacuity, here, in Heartbreak Hotel, Feldman’s canvas made sense. It was a monumental ode to depression and its all-consuming experience. It reminded me of the moment in Lars von Trier’s Melancholia in which Kirsten Dunst’s character Justine sobs over her meatloaf dinner, exclaiming, somewhat campily, that, “It tastes like ashes!” With clumps of paint in her grey color field, Feldman’s painting looked like ashes too. And with its title, the work seems to express that this grim outlook is warranted. After confronting Feldman’s descent into sadness and even, nihilism, the rest of the exhibition didn’t get any cheerier. It made me feel like popping a Prozac. Andy Coolquitt’s o^r stood in the center of the small space with one red bulb attached to a minimalistic stand. Like a burned-out flame, Coolquitt’s sculpture was a tragic site of failure, and even, with the red bulb, lost passion and thwarted love. 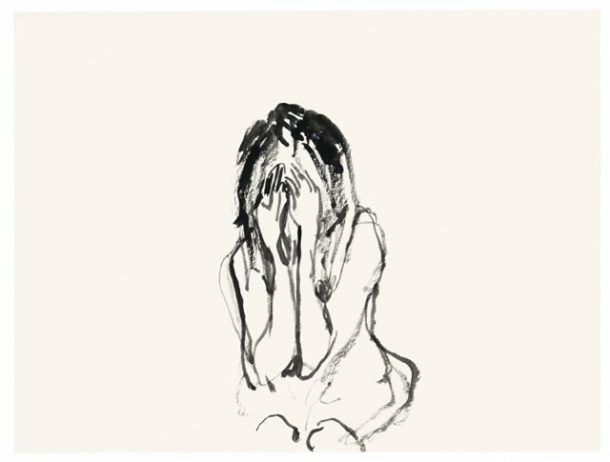 Opposite Coolquitt’s sculpture, the gallery hung a salon-style wall, which included the godmother of romantic angst, Tracey Emin’s gouaches of women crumpled in tears. In the same display, Paul P.’s watercolors render the Fogo icebergs as nearly abstract representations of quiet isolation, while Jack Pierson’s painting Untitled obscures the sun with a scribble of black acrylic paint. It looked like a commercial for Zoloft–all that was missing was that little blob. While none of these works could be construed as actively and obviously political per se, the works’ reflection of depression and other negative emotions, both together and separately, assert an alternative form of political response. In fact, depression might be the de facto reaction to political failure. In her dive into depression–Depression: A Public Feeling, Cvetkovich links depression to the more radical queer displeasure with mainstream LGBT politics. “The queer predilection for negative affect and the virulence of debates about the antisocial owe something to the turn that mainstream lesbian and gay politics has taken toward homonormativity and queer neoliberalisms,” she observes, “As a queer project, Public Feelings tries to reimagine a liberatory version of social and affective relations beyond the liberal versions that have come to dominate the public sphere of gay politics. Discussions of political depression emerge from the necessity of finding ways to survive disappointment and to remind ourselves of the persistence of radical visions and ways of living” (6). This is mirrored in Lisa Kirk’s Rusted Rainbow. 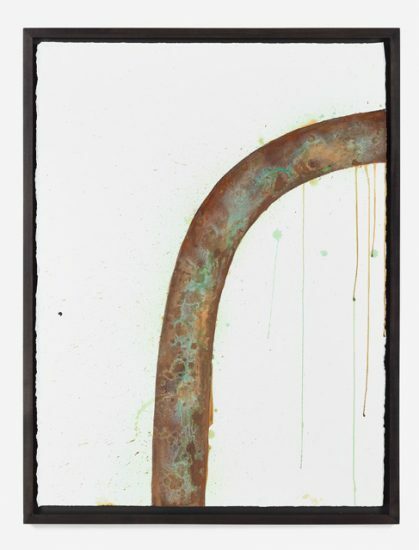 Whether intentional or not, Kirk’s rusted half rainbow could also be interpreted as a critique of mainstream gay politics as symbolized by the rainbow. Rather than a bright and vibrant depiction of coalition politics, Kirk’s rainbow has seen better days. It’s worn-out and decayed. In addition to a symbol of LGBT pride, the rainbow also acts as a metaphor for almost childlike glee and joy gone bad. In his essay “Feeling Brown, Feeling Down,” Jose Esteban Munoz engages with melancholia in the work of Nao Bustamante. Analyzing Munoz’s essay in her own Hold It Against Me: Difficulty and Emotion In Contemporary Art, Jennifer Doyle explains, “Munoz draws from scholarship on racial melancholia in his reading of affect in Bustamante’s work to point to the way artists deploy negative affect to resist the social imperative for the minoritarian subject to produce a whole self and “be happy.” In that refusal to adjust, Munoz identifies a critique of the system that would make happiness and a sense of wholeness prerequisites for full political participation” (104). This conscious refusal of happiness for full political participation is observable in the work of Cary Leibowitz, otherwise known as Candyass, who I can’t believe I haven’t featured on Filthy Dreams before. His dismal text-based declarations of failure, lack, misery and dejection read like a Pepto-Bismol-colored therapy session. They’re also campy and thoroughly queer, reveling in failure to attain happiness. 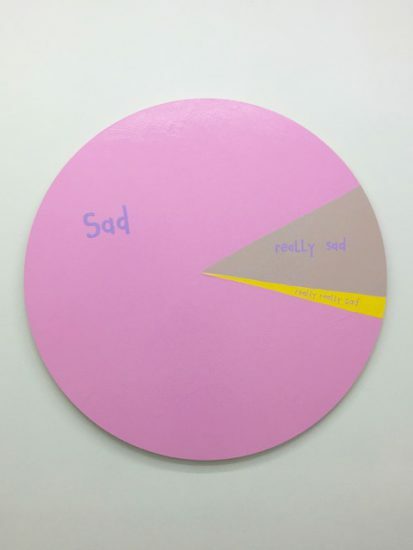 One of these pink paintings works is on view in the gallery’s back office–a circular work depicting a diagram with the options “Sad, really sad and really really sad.” How uplifting! Leibowitz’s art wallows in bad emotions as a form of defiance. I mean, gay doesn’t have to mean happy. This is further emphasized in his new series of works in which places labels over vintage photographs. 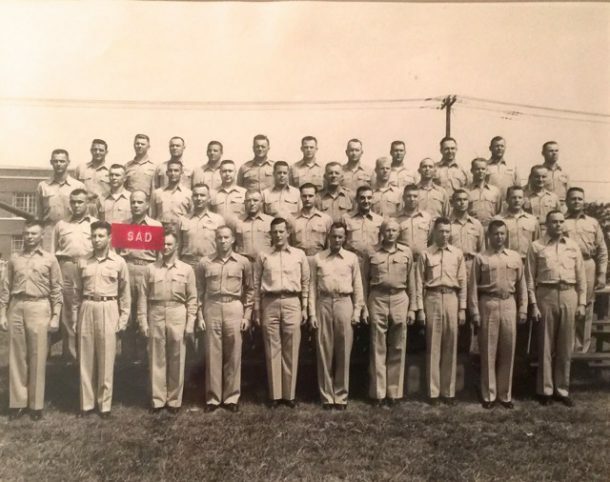 In one, the artist pastes a red label that reads “sad” over a group of men lined up like a military or rotary club. 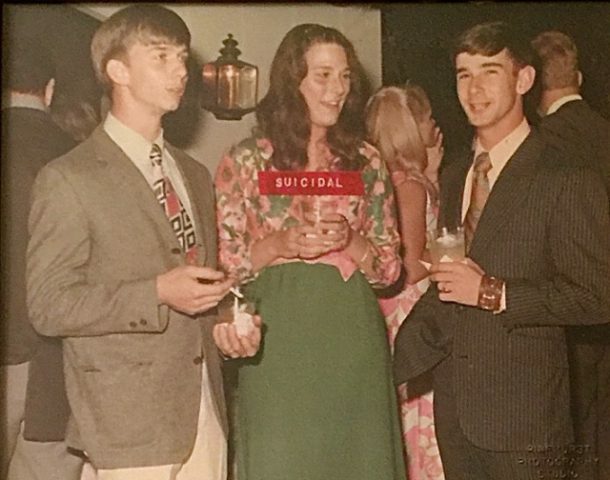 In another, a girl at a 1960s, flanked by two men, is covered with the label “suicidal.” Both of the scenes in these photographs are supposed to be gleeful situations, exemplary of mid-century American satisfaction. But here, they’re punctured by the all-too-personal admission of sadness, self-harm and suicidal ideation. Both works are examples of the incapability to live up to the cheery American, hypercaptitalist hetero- or homonormative ideal. And like Jack Halberstam’s The Queer Art of Failure, there is a certain subversive power in reveling in this failure. Beyond just the individual works in the show, Heartbreak Hotel also reveals the collective importance of feeling bad together. With so many artists, it’s hard not to see the show as a type of artistic group therapy. Cvetkovich, in Depression: A Public Feeling, sees some therapy practices as not antithetical to politics. She writes, “The encounter between feeling and politics is thus open for discussion of forms of activism that can address messy feelings rather than trying to banish them, and that can more fully embrace the role of practices that resemble “therapy” (such as processing) within politics” (110). Tags: Amy Feldman, Andy Coolquitt, Ann Cvetkovich, Anne Bean, Bibbe Hansen, Cary Leibowitz, Dan Schein, Depression: A Public Feeling, Diana Shpungin, Dietmar Busse, Elvis, Heartbreak Hotel, Heather Love, Invisible-Exports, Jack Pierson, Jennifer Doyle, Jose Esteban Munoz, Julee Cruise, Katherine Bradford, Kay Rosen, Keith Mayerson, Lisa Kirk, Lucas Michael, N. Dash, Paul Gabrielli, Paul P., Sianne Ngai, Tracey Emin, Ugly Feelings. Bookmark the permalink.